Some of the most innovative, forward-looking alternative learning experiences for kids today are built on the notion of games and gaming. Edutopia, the teaching and learning website, even has a Pinterest board devoted to game-based learning. Many commercial games that teach biology, math, history, geography, and every other subject imaginable are infiltrating traditional classrooms, and for particular subjects or problems, that makes a lot of sense. But for this blog post, I wanted to look at why educators would create an entire curriculum based on gaming. 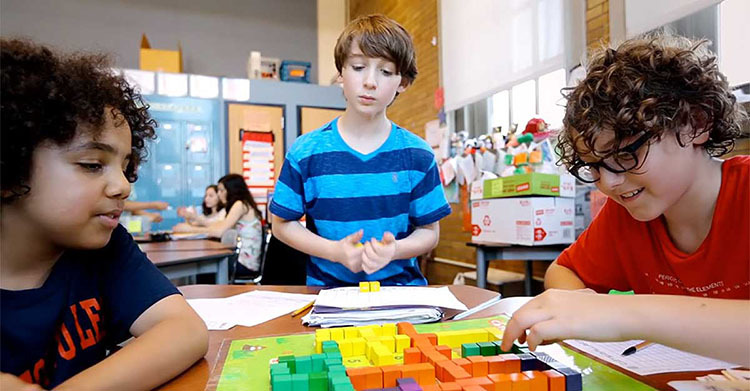 In New York City an innovative school for grades 6–12 called Quest to Learn is an evolving project to improve kids’ learning, empathy, and collaboration skills. In reading about Quest, I learned the basic tenets of the gaming approach—and then I was lucky enough to interview Austin’s own Cheryl Kruckeberg, who has been advocating for game-based education and running Game of Village, a program based on these tenets, for years. Games ask us to collaborate with others and learn by doing. In a game, teachers and students can see immediately whether they are succeeding or failing and can go back and try again, or “iterate.” Failing is an important part of learning in any game, and (unlike a failing grade in a traditional classroom) helps motivate kids to keep trying. Everyone gets to participate and contribute something unique to the process. Feedback happens in the moment, not days or weeks later in an exam. The problem in most grade-based education, says Cheryl, is that it tells kids that an “F” is a statement about who they are, and that may very well change how they think about themselves. “All of that judgment is gone in the concept of the game,” she explains. Kids are having fun and working together to improve, not anxious about judgment and evaluations from others. Readers of the blog may have met Cheryl a few months ago, when she wrote a blog post about exactly how Game of Village works—creating an entire alternative village-world on a 1/24 scale, with 3-inch avatars, or “peeps” who inhabit the village. Games ideally last about 25–30 days and include around 25 kids, but the time period can span an intensive five or six weeks, or can be spread out over an entire school year for one day each week. Often the kids in Game of Village are of a similar age—around 10 to 14, but sometimes there are 8-year-olds, and those kids find unique ways of playing the game, says Cheryl. “The older kids get into the heady stuff and deep research, but younger kids do more of the crafting.” Just as in real life, both thinkers and crafters are critical to success. “For me, somewhere along the line education got separated from learning,” Cheryl explains. “People really want to learn, and that distinguishes us as a species. Sparrows will just build nests the same way, over and over—but human beings want to try this, that, and the other thing, always trying new alternatives.” In a nutshell—or an eggshell—this is what game-based learning provides. 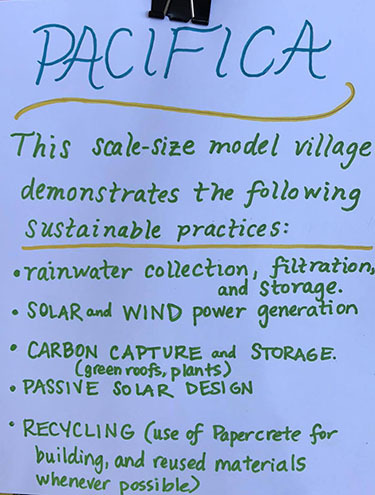 Game of Village kids completed their creation of Pacifica, a sustainable village for the planet Kepler-9D, on May 19 at AHB Community School. Students at Integrity Academy will experience a full unit of Game of Village next year. More information about Game of Village and how your kids can get involved is available here. And for another fascinating take on role-playing games and learning, check out a recent article by Paul Darvasi for KQED News, about Sword and Sorcery Camps. My work at Alt Ed Austin includes visiting lots of great innovative schools and enrichment programs and getting to see some beautiful ideas in action. There’s no program I love more than Game of Village, so we’re thrilled to have Village director and consultant Cheryl Kruckeberg join us on the blog for a show-and-tell about its educational benefits and sheer delights. Read on to learn how you can get your kids signed up for Village this month! whatever and wherever we want to go. Throughout history, children have prepared for their adult lives by observing and modeling the activities of the adults around them. They imagine, pretend, and practice, and through these activities they gain understanding, stretch their capacities, and explore new concepts and ideas. In play children are released from the constraints imposed by a fear of failure and are left free to experiment. In short, they grow! Play is, in fact, a natural and powerful way to learn, and Village is all about play! Each game of Village is set in a particular geographical location and time period. It starts with the bare bones of a story line: some challenge to be faced, a problem to be solved, or obstacles to overcome. From this loose outline and the fertile imaginations of the players a world emerges. Village is played on two integrated levels. On a 1/24 scale the players, known as “Villagers,” design and build a complete village. This aspect of the game includes a “Peep,” a 3" avatar, with an independent personality, life story, and hopes and dreams. Peeps want a home; Villagers design it for them. Peeps want a piece of land on which to place their fine homes; Villagers get that for them as well! Peeps like party hats, rocket ships, furniture, and social gatherings. (Some of them, like the unique character below, enjoy hammocks, too.) They become embroiled in scandal and drama! There are weddings, fundraisers, funerals, kidnappings, and robberies. Fulfilling the demands of the Peeps and keeping up with their antics keeps Villagers pretty busy. Using their Peeps’ home design and land as collateral, and inspired by the needs and wants of the Peeps, Villagers head off to the Village bank to secure a loan and begin making purchases for their many new projects. And here begins the second aspect of the game. Now the Villagers are running their own dynamic community. With money in hand, they go to the Trading Post to purchase all manner of goods for building their Peep homes, general crafting, and various independent enterprises. Villagers open businesses; apply for jobs at the bank, trading post, newspaper, or post office; run for government office; or perhaps attend the Village University. There are many ways for Villagers to earn income and stay busy! Money and time management and goal setting become important: some Villagers accumulate wealth, others overdraw their bank accounts. Will the Villagers form a government? If they do, will that government be ethical and trustworthy or crooked and out for personal gain? Will laws be needed to keep the peace and ensure that all are treated fairly? The Villagers themselves will determine all of this and more. As in real life, there are model citizens, civil servants, bakers, and artists—as well as scoundrels, loafers, and ne'er-do-wells. It's all learning and all valuable! The possibilities are endless, and the game takes a new turn each time it is played. From designing and building the scale model village for the Peeps, to managing personal projects and jobs, to attending to civic matters and the myriad interpersonal issues that always arise where groups of people converge, Village is filled with valuable, real life learning. Village is dynamic, unpredictable, and messy. It's challenging, rewarding, and fun! Village, like life, is filled with unforeseen circumstances and opportunities and, although children may play it over and over again, it is never the same and never loses its appeal. Village is filled with peer-based learning, natural consequences, and “Aha!” moments. In Village, young people step into leadership, confront real problems, and collaborate to find creative solutions. They take on the world, and they do an admirable job of it! As a teacher, mentor, and school director of 40+ years, I can confidently say that Village is the most powerful teaching tool I have ever encountered, and it has completely transformed my understanding of learning and teaching. Most importantly, it has transformed and vastly expanded my view of what young people are capable of. Village has provided me a platform from which to explore and teach applied academics in a meaningful context. I have learned to trust the natural learning process and have grown comfortable with the chaos and mayhem that can come with letting creativity, self-expression, and learning by experience take reign, rather than imparting knowledge in a controlled learning environment. Moreover, Village has brought the spirit of play, creativity, and trust back into my own adult life. Village has become my passion, and it's my goal to share it with as many young people and mentors as I can! Village takes roughly 25 days from start to finish. It has been played as the central component of an integrated, academic school curriculum, with homeschool groups, and as summer camps. It is best played with 20–26 (or so) children, aged 9–14 years (or so). However, Village, like life, can be adapted to a wide array of circumstances and needs. 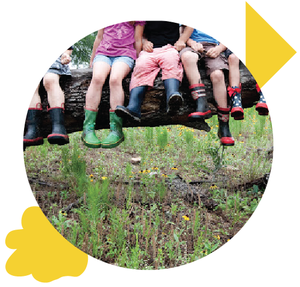 For the past 10 years Village has been the heart of the Austin EcoSchool/Village Academy curriculum. With the recent closing of this wonderful school, Village is now loose; unfettered by a brick and mortar location, Village is free to come to you! If you would like to register your child in an existing Village program or are interested in bringing Village to your child’s learning community, please contact us at play@gameofvillageaustin.org. A Friday Village program is starting at AHB Community School on January 6, 2017, and is open to the homeschool community. Applications are accepted through mid-January. We are also in the process of launching a Summer Village, complete details of which will be available soon. You can keep up with VillageinAustin by liking us on Facebook. Or read much more about us on the new Game of Village Austin website.